Today an Italian Developer named Andrea Oliva released a Tweak in Cydia which is used to customize your iPhone via Cydia. The name of the Tweak is HUD Controls Plus. 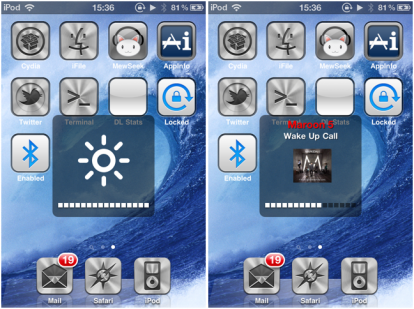 In this tweak some new features were added to customize the look of iPhone. Like when you press the volume button so you can see customized picture in it.Below is a sample picture taken by folks over iphoneitalia. To Enable/Disable this Tweak you can go into settings and perform the task easily. HUD Control Plus can allow you to add the following features. The another best thing about this Tweak is that, when you double tap on the Volume button you can see the current song playing, send SMS,Mails, Make calls and E.T.C. This Tweak is available in Cydia for $0.99. So go and grab this awesome Tweak. To get this Cydia Tweak you must be Jailbroken on your iDevice.